Dogs showing aggression while eating or when his food is around are specifically termed as food aggression. This is a serious issue which may need immediate care from the side of pet guardian before the situation gets out of your hands. To understand food aggression in detail, we will discuss about it and tips to control it. Why does your dog go through Food Aggression? Canines have a natural instinct of protecting their food which may become defensive while they are having their meal. They have a fear of losing their food to other animals, and being aggressive while eating is their way of dominating their bowl and food. Well, the answer is no! There are three types of food aggression: mild, moderate, and severe. 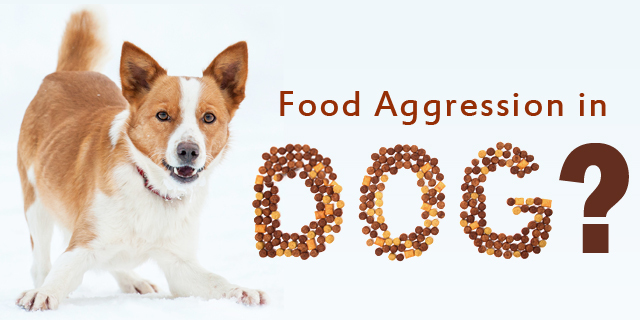 If your pooch is going through a mild food aggression, he may just growl and show his teeth. Moderately aggressive dogs snap and lunge towards you if you try to go near him while he is dining. Severe conditions may need your attention immediately as in such conditions, dog usually bite the confronter. How to control food aggression in dogs? Food aggression is not that common in dogs, and that is why it becomes necessary to check your pooch’s overall behavior when he behaves defensively while eating. Heck if your companion is possessive only about his food or all his other things like toys, bed, your attention etc. The first thing you should do is to be consistent in feeding your pooch. Dogs may get anxious over the unsure meal timings or whether they will get food or not. To overcome this fear, try to be consistent in feeding your pets. This will let them set an internal clock of meals just like they get to know that it’s time to go for their walk. Have you ever wondered why treats work for dogs and how they help us teach some great tricks to our furry friends? As it turns out, canines feel a sense of proud when they earn something. Therefore train your dogs to sit patiently while you put their bowl. Walking your pooch before his meal can help him feel like he has earned his food which reduces the probability of food aggression in canines. Many pet owners back out when the dog starts growling after they put the bowl in front of their pet. This may be a wrong notion and sends a winning signal to dogs. They may start thinking that they won their bowl of food and may behave the same every day. Thus, in place of backing away, stand there and calm them. Leave only when he calms down and you pat him for being a god boy. If your pooch doesn’t calm till you back out, try feeding him with your hand. This will reduce his fear of losing his food to you. Moreover, he will get your scent and eventually he may get used to eat in your presence and not get threatened by your presence. As we discussed earlier, treat are like magic wands when it comes to pets. Tossing a treat when the canine seems to behave well during his meal may signal him positively. From that point onwards, he may behave well to get his favorite treat tossed in the food bowl. Although dealing with food aggression in dogs may not be that easy, these tips may prove to be a great help for pet owners. If still your pooch behaves aggressively, then you may need to consult your vet and get some behavior treatments from him. PREVIOUS POST Previous post: Why Is Daily Exercise Crucial For Your Dog’s Good Health? NEXT POST Next post: Unwrapping Christmas Gifts For Our Furry Friends- Season Discount at Canada Vet Express!